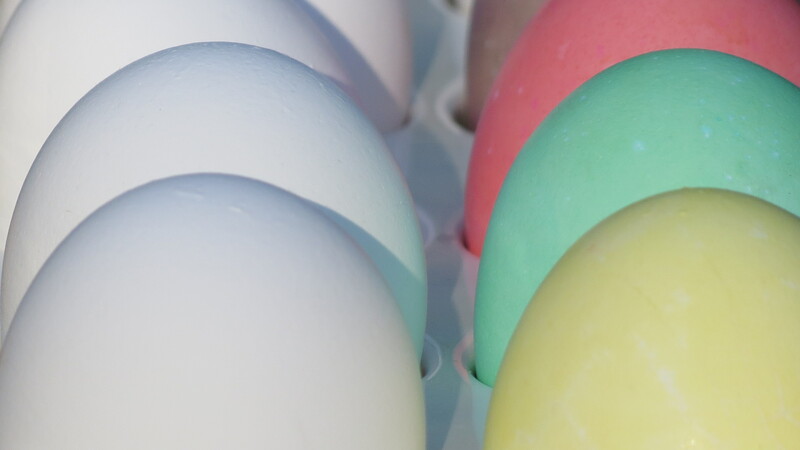 I was all set to do a before and after photo spread, starting off with white and colored eggs in the spirit of the Easter holiday, and then segue into a series of photos about my pre- and post-Spring clean-up. 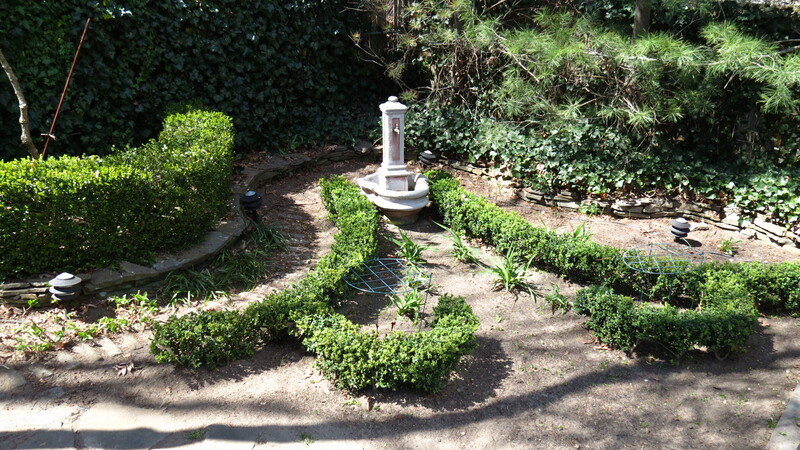 Before: The implied knot garden. 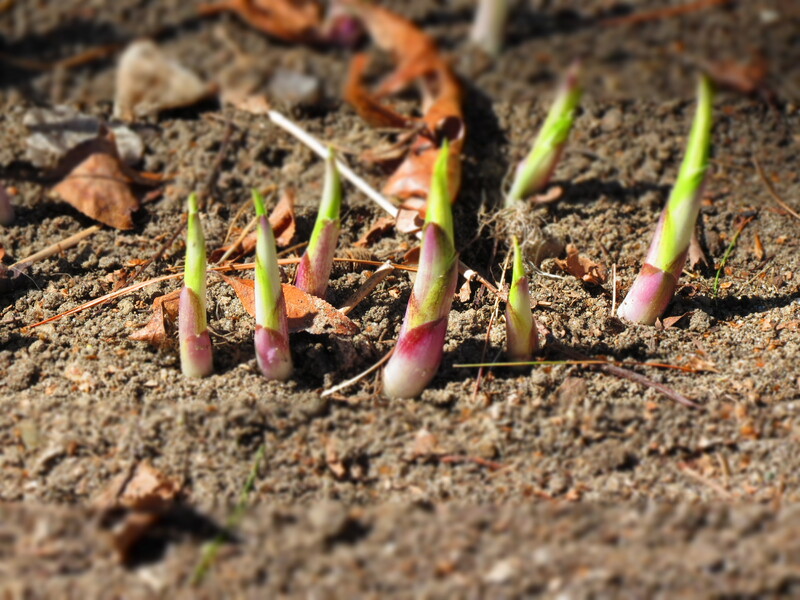 My raking , though, became more of an excavation as I uncovered plants that I hadn’t seen in some time — and my imagination kicked in. Suddenly, I was a space explorer hovering over an unchartered alien world, boldly going where no man had gone before. Or, in keeping with the season, I was Alice down the rabbit hole — and the garden grew curiouser and curiouser. The Valley of Lily of the Valley. 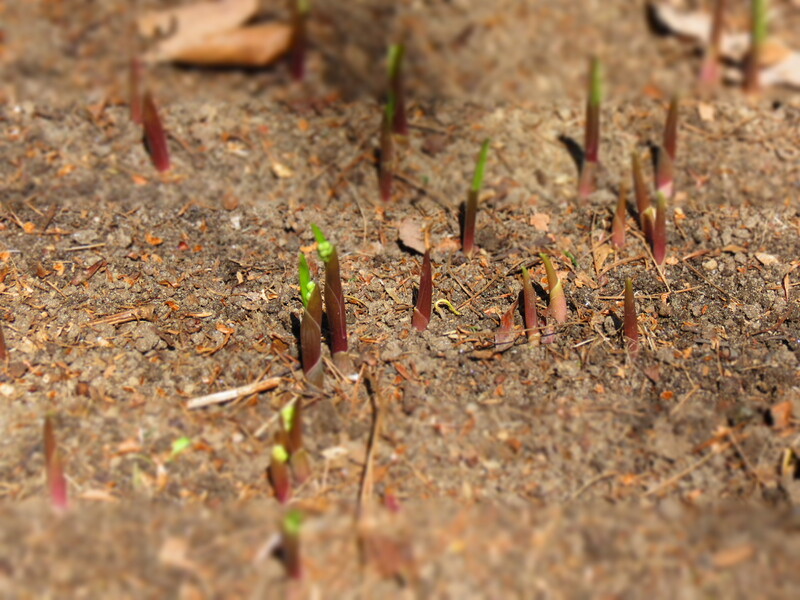 A view of Hosta Heights. The edge of the Great Boxwood Forest. 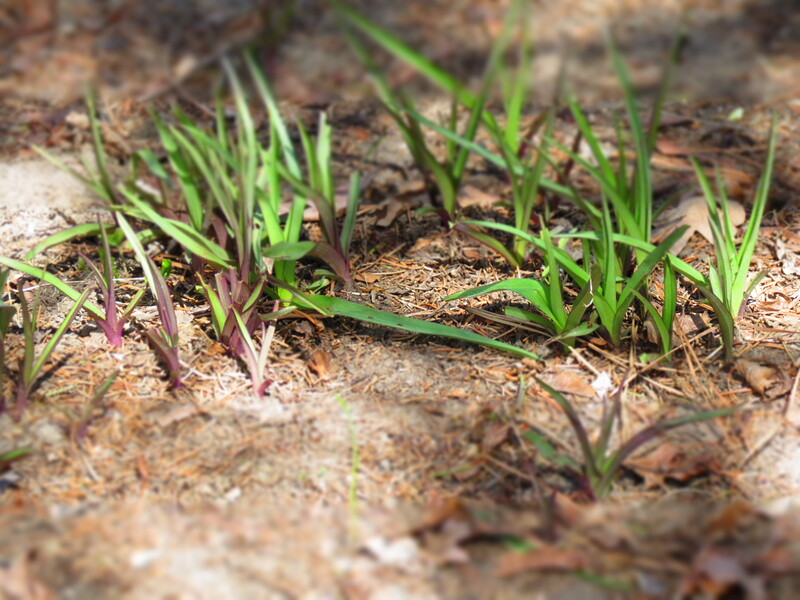 The Spiderwort Wood, or as the local tribes call it, Tradescantia. The Great Desert was once a colorful jungle. What happened here? 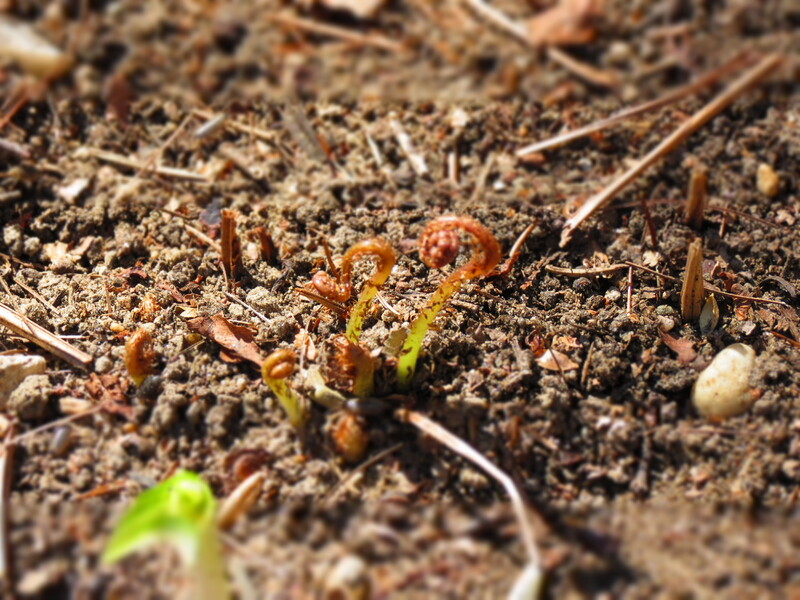 The unfurling tendrils of the Ferocious Ferns are poised to snag an unsuspecting wanderer. When I came to, I was back in my garden, rake in hand and surveying my work . . .
After: The implied knot garden.
. . . still unsure about where I had been. But at least I have the photos to prove that it was a real place. ← Extra! Extra! Weed All About It! Looks good! What a difference a good weeding makes. Hope you have a great Easter break! You’re not kidding. It feels good to be outside and to clean away winter. Happy Easter. I like the perspective that you took the images. It really does look like you were miniature in another time and place. Thanks. It’s a filter that miniaturized by blurring the top and bottom. It makes ordinary images seem toy-like. I’m obsessed with it. Very easy to lose yourself in the garden, time flies, you relax, the world seems a happier place and life is good! Shame we have to wake up from my day-dreaming. Fortunately, I’m on vacation this week — and that’s a full week of solid time to be outside in the garden. Heaven! Your babies. Brought back memories. I’m still a thousand miles from home so doubly appreciate what’s going on close to the earth in the Northeast. Glad to hear it brought back memories. Wherever you are, enjoy the holiday! Hello, Beth. Glad you enjoyed the journey — there’s always an adventure in the garden. Happy Easter to you, as well. Kevin, the reemergence of the garden is always a beautiful distraction. It stops me in my tracks every time. Hope you have a wonderful Easter. Mario, it feels great to just inhale! I think spring has the best kind of breathing. Enjoy the holiday! Debra, at this time of year, the changes seem to happen minute by minute. It’s all very exciting! Enjoy the holiday! I really like your post. I especially like the photographs of the knot garden and the Boxwood Forest. Nothing. Nothing at all wrong with that. Or with actually doing it! Do you mind if I ask what kind of boxwood that is? 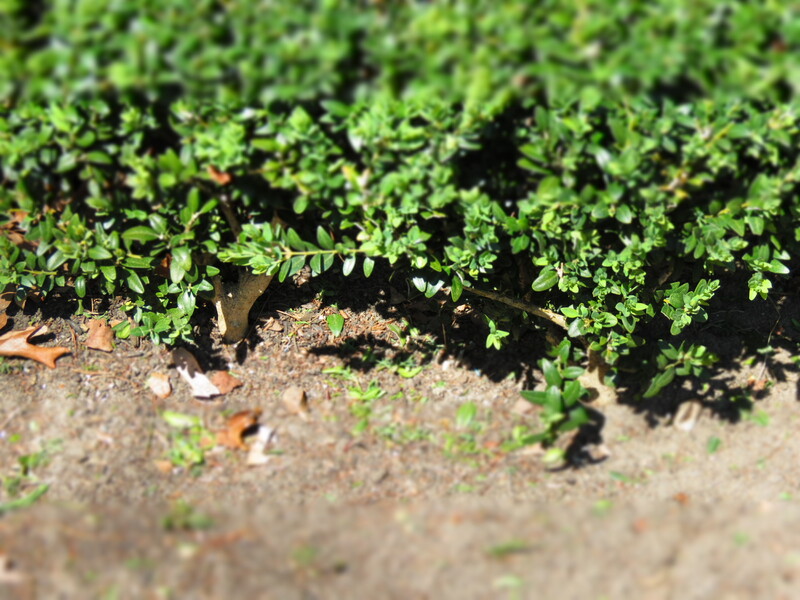 It’s just ordinary boxwood with small leaves — I’m sure I used to have a label. 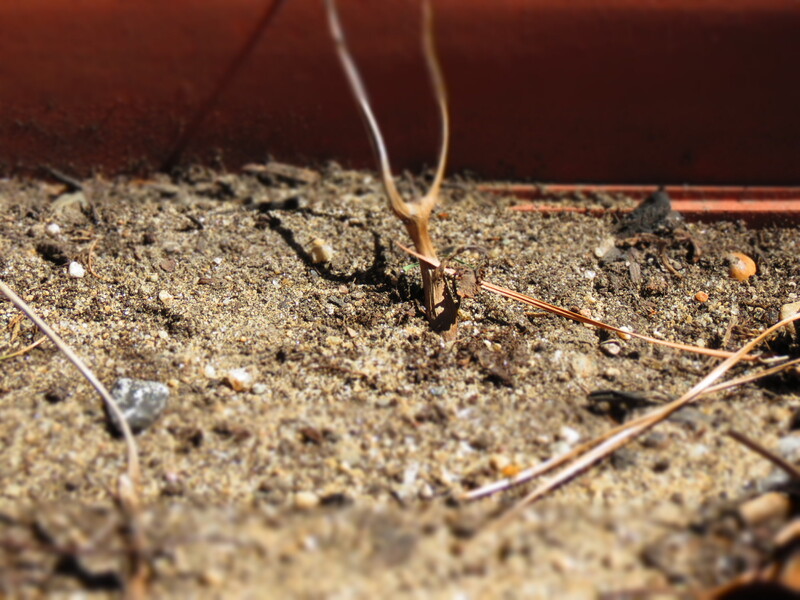 When I purchased them, they were small plants, and I’ve trimmed them to remain small, only about 10 to 12 inches tall. Sorry I couldn’t be of more help. If the label pops up, I’ll let you know. Hi Kevin! Hope you’re having a lovely Easter weekend! Happy Easter! Loved the little trip. Glad you got photographic evidence. I think I saw a white rabbit running by! 🙂 I may need to make a “fantasy” map of the yard for other wanderers and explorers. Happy Easter Kevin! The boxwood forest looks deliciously enticing. I can see how you ended up falling down the hole when there’s such delights to see. Glad we got you back though. So glad you liked the knot garden. One of the reasons I planted it is that I was looking for year-round interest. The structure of it looks great in winter snow and summer sun. Enjoy the day! Maybe I’m not doing it right. Do you have or do you plan to have a post on how to properly weed? I have a vegetable garden. It’s approx 75 ft x 90 ft and I have 27 rows and spaces to weed. I figure if I can do two a day they will each get weeded about once every two weeks, which is really not enough. Especially since I can’t really do it every day. I think I need an efficiency course in garden weeding. Unfortunately, I really don’t have a plan or a technique. 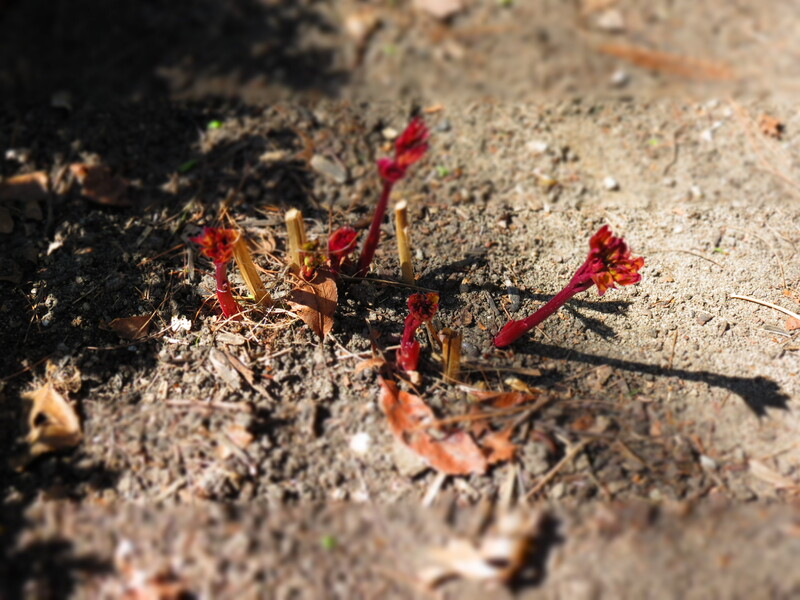 I like to weed in the morning or after a rain — they’re a little easier to pull out of the ground. For something your size, it probably helps to have a tool of some kind to keep the walking spaces clear. Some people use weed blocking material that allows water to pass through but prevents weeds. I’ve never tried that, so I do not know how it works. Other than that, it’s good old fashioned pulling — although I think it does make sense for a garden that size to have a plan. If I learn of anything else, I’ll let you know. Thanks for your reply. The ground is pretty hard here, so I did get out a tool yesterday to help break it up around the weeds to make them easier to pull. As far as the spaces in between the rows, I am thinking that maybe it would be a good idea to keep some vegetation in there and just mow it short to help keep the mud down. This is only our second year with the garden, so I am hoping that the leaves and mulch that we turn in with the tractor between growing seasons will help loosen up the ground eventually. I’m not a vegetable gardener, but I do like the idea of keeping vegetation between the rows. 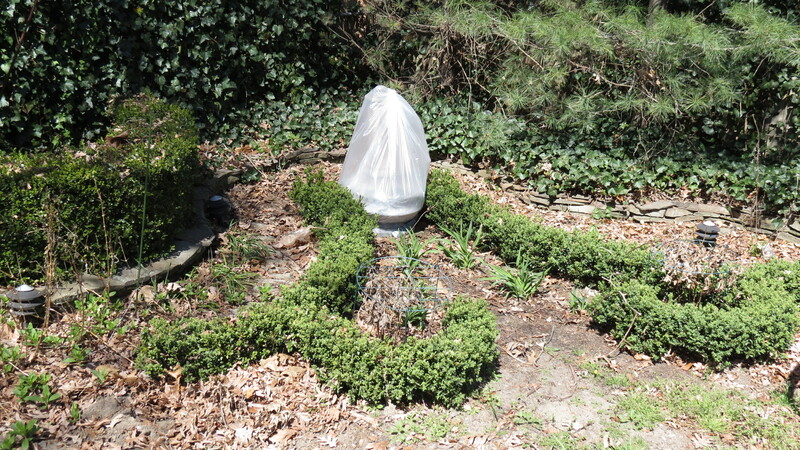 And a nice layer of mulch can help control weeds in the growing area. Good luck with it!